Holmatro Incorporated has been manufacturing high performance rescue tools in Maryland Since 1988. Founded in the Netherlands in 1967, Holmatro, has over 40 years of experience manufacturing high pressure hydraulic equipment. Holmatro operates three manufacturing facilities, with two in Europe and one in the United States. Through our dealer network Holmatro offers product, training, service and support to our customers on every continent. Rescue and emergency services personnel around the world depend on Holmatro's technology to make their critical tasks easier, safer and more reliable. Holmatro has a rich history of product development and innovation. For us product improvement is an ongoing process. The challenges of rescue are changing. Today the rescuer must face new materials, new designs and new technologies whether at the scene of a vehicle accident, building collapse or natural disaster. That is why Holmatro is always improving, always developing new products and always bring new solutions to the market. Holmatro Rescue Equipment manufactures high-pressure hydraulic rescue equipment for fire brigades and rescue organisations. Holmatro rescue tools are recognised worldwide for their high quality and performance. Holmatro Industrial Equipment produces high-pressure hydraulic lifting, bending, pulling and cutting equipment for industrial applications. In addition to standard equipment, the company has a proven track record with special projects. Holmatro Marine Equipment specialises in onboard hydraulic systems, boom vangs, backstay tensioners, cylinders, control panels, emergency cutters and winches, meeting the needs of modern or classic yacht sailors. Since 1990, Holmatro has been the official rescue tool of premier open wheel racing in the USA. 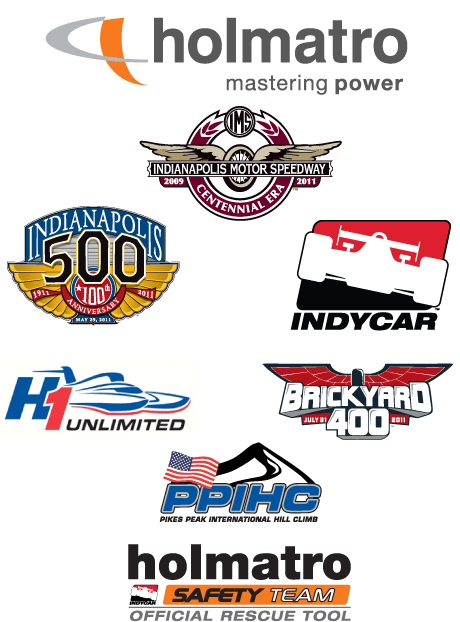 During the years when Indy Car and Champ Car were split, Holmatro was one of the few sponsors to support both series. Despite their different directions, both series traveled with dedicated safety teams who chose Holmatro has their rescue equipment partner. In 2008 the two series unified and Holmatro is proud to continue supporting their safety program. With the innovation and space age construction used in the world of motor sports, it’s even more critical for their safety crews to have rescue tools that keep pace with technology. Our affiliation with motor sports helps keep us looking forward, always improving, always developing new products and always bringing new solutions to the world of rescue. Our North American Headquarters is located in Glen Burnie, Maryland (seen above), across the street from the Baltimore-Washington International Airport. This state of the art manufacturing facility is ISO 9001:2000 registered and follows the strictest quality control procedures…our own. We utilize the most modern CNC machining centers, assembly techniques and quality control equipment. Holmatro products are first proven on our laboratory bench-top, and must meet our strict quality standards, before they are allowed to prove themselves in the field. These rigorous standards include: durability, lateral loading, mechanical deformation, over-pressurization and extreme temperatures. Striving to set Holmatro’s quality apart from all others, Holmatro set the bar by being the first and still the only company to offer UL Listed rescue tools. And we offer the most comprehensive line of NFPA Compliant rescue tools in the world. Still, every tool and power unit is operationally tested before we allow it to leave our factory and make its way into the hands of our customers. In addition to the manufacturing facilities, our Glen Burnie location features a training center that is equipped to teach service, maintenance, and extrication techniques. Adjacent to the classroom is a hands-on training area that allows us to continue working, even when the weather outside doesn't cooperate. Our administrative offices complete our Glen Burnie facility. Holmatro always welcome visitors, so the next time you are in the Baltimore area, be sure to call and arrange a tour. Holmatro is proud to offer products made in the USA, with unmatched precision and quality. As main specialization full-service oilfield supply company AZ Supplier offers distribution services for all products of Holmatro in territory of Kazakhstan.